The Physical Description of Signals: Introduction. Simple Harmonic Motion. Propagation of Sound. Measurement of Acoustical Strength. The Spectrum. The Fourier Transform. Amplitude Modulation. Frequency Modulation. Filters. References. Cochlear Structure and Function: Function and Structure of the Cochlea. Macromechanics. Micromechanics. Cochlear Nonlinearity. Summary. References. Neural Signal Processing: Sound Frequency. Sound Level. Modulation. Speech and Vocalization. Cues for Localization. Summary and Concluding Remarks. References. Loudness Perception and Intensity Coding: Introduction. The Perception of Loudness. Parametric Studies of Intensity Discrimination. Models of Peripheral Intensity Coding. What Limits Intensity Discrimination? Intensity Discrimination and Loudness. Detection of Tones in Noise. Summary. References. Frequency Analysis and Masking: Introduction. The Power Spectrum Model and the Concept of the Critical Band. Estimating the Shape of the Auditory Filter. Summary of the Characteristics of the Auditory Filter. Masking Patterns and Excitation Patterns. The Additivity of Masking and Excess Masking. Phenomena Reflecting the Influence of Auditory Filtering. Nonsimultaneous Masking. Evidence for Lateral Suppression from Nonsimultaneous Masking. The Enhancement of Frequency Selectivity Revealed in Nonsimultaneous Masking. Summary. References. Temporal Integration and Temporal Resolution: Introduction. Temporal Integration. Temporal Acuity. Conclusions. Appendix. References. Across-Channel Processes in Masking: Introduction. Profile Analysis. Modulation Detection or Discrimination Interference. Concluding Remarks. References. Pitch Perception: Introduction. Pure Tones. Complex Tones. Nontonal Pitch. Pitch Scales: Relative and Absolute. Multidimensional Aspects of Pitch. References. Spatial Hearing and Related Phenomena: Introduction. Binaural Processing. Localization and Spatial Resolution in the Free Field. The Precedence Effect. Conclusions. References. Models of Binaural Interaction: Introduction: Cross-Correlation Models of Binaural Perception. Structure of Binaural Cross-Correlation-Based Model. Extensions of the Cross-Correlation Approach. Ability of Cross-Correlation Models to Describe Psychoacoustical Data. Summary and Conclusions. References. Auditory Grouping: Introduction. Peripheral Considerations. Mechanisms of Auditory Grouping. Harmonicity. Onset and Offset Asynchrony. Amplitude-Modulation Phase Differences. Frequency Modulation. Lateralization. The Nature of Auditory Grouping. References. Timbre Perception and Auditory Object Identification: Introduction. Sound Production. Experimental Results On Timbre and Object Perception. Neuropshychological Evidence. Concluding Discussion. Reference. Index. 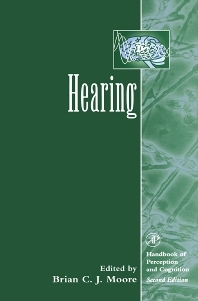 Hearing is a comprehensive, authoritative reference work covering both the physiological and perceptual aspects of hearing. Intended for researchers and advanced students in the field of hearing, it reviews major areas of research in addition to new discoveries, including active mechanisms in the cochlea, across-channel processes in auditory masking, and perceptual grouping processes. Researchers, academics, and clinicians in hearing. Psychologists interested in perception, sensory physiologists, audiologists, and audio engineers.